Warren Buffett adds a degree of difficulty to an activist shareholder’s Coke challenge. Value investor David Winters is now on his second campaign to inject some fizz into Coca-Cola. The Sage of Omaha’s vocal backing of Coke boss Muhtar Kent, though, makes it harder to shake things up. Coke deserves criticism. Its shares have underperformed the S&P 500 Index by 20 percent since 2010 as Americans have ditched fizzy drinks in favor of healthier alternatives. Coke has not been aggressive enough about cutting costs to adapt. Winters opened a fresh can of complaints after Coke’s lackluster results last week, sharing a letter to shareholders that, among other demands, called for the separation of the chairman and chief executive roles and argued that Coke’s 26 percent pre-tax margin is too low. He reckons it should rival beer maker SAB Miller’s 34 percent showing or even AB InBev’s 40 percent. The trouble is, he did not offer much in the way of details. Unlike seasoned activist Nelson Peltz’s Trian Partners, which is famous for its lengthy white papers about its targets, Winters only published a three-page note and a couple of 105-second-long videos. He’s on to something, though. Analysts at Bernstein Research reckon Coke could save up to $4 billion a year by bringing its costs into line with consumer goods peers. That’s way above the $1 billion of cost cuts recently identified by management, and would imply a margin of over 30 percent. Having Buffett as a major shareholder does not make the company unassailable. Short seller Jim Chanos’s Kynikos Associates went after Moody’s in 2007 before the credit crisis fully hit; the rating agency’s stock plummeted over 70 percent. And Buffett agreed that Kraft was right to break itself up in 2011 after activists including Peltz quietly campaigned for it. A more rigorous analysis of where and how Coke can improve might help get Buffett onside. Bottles of Coca-Cola are seen at their bottling plant in Clamart near Paris. 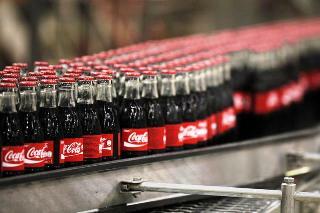 Coca-Cola Company hit the market with an aggressive US$4.5bn deal last week. The company’s largest trade yet, it will take out expensive bonds and align the issuer’s capital structure about a month after its acquisition of its North America bottling operations. Value investor David Winters on July 23 said that Coca-Cola’s board of directors and management should be replaced if they are unable to improve the soft drink maker’s financial performance. The comments came after the company’s second-quarter results disappointed investors. In an letter to Coca-Cola shareholders on July 8, Winters, whose investment firm owns 2.5 million shares in the company, said there was “no reason” it shouldn’t be able to improve its profit margin. Earlier in the year Winters and several other investors had opposed the company’s equity compensation plan, arguing that if all the stock awards covered by it were granted, exiting shareholders would be significantly diluted. Warren Buffett, chairman of Berkshire Hathaway, Coca-Cola’s biggest shareholder, said on April 23 that he disagreed with the equity compensation plan, but abstained in a shareholder vote because he did not want to send a signal that he disapproved of Coca-Cola’s management. He said in an interview on CNBC that he thought Chief Executive Muhtar Kent was the right man to run Coca-Cola.